A new Media Molecule employee tells a heartwarming tale that saw him go from construction worker to videogame designer. For John Beech's entire life, all he'd known was backbreaking construction work. Now, 27, he works at Media Molecule doing construction on titles like LittleBigPlanet 2 instead. Beech was one of the lucky LittleBigPlanet community members hired by Media Molecule for exemplary amateur creations, but the story of how he got there is anything but average. Beech is a self-described "dimwit on paper," because terrible migraines prevented him from taking exams in school. He left at 16 with little qualifications and moved right into construction. Through a lifelong gaming habit, he became interested in LittleBigPlanet, and the game's construction tools changed his life. 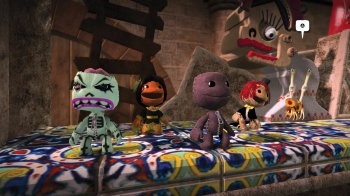 Creating LittleBigPlanet content was something that came naturally to Beech, known as "Johnee" on the PlayStation Network, whose levels such as "Future Warzone" were universally praised by players checking them out online. Before he got the guts to publish them, Beech had to deal with a girlfriend that budgeted his playing time and made him get under a quilt with the television at night so he could build while she slept. However, a disapproving girlfriend was the least of Beech's troubles before ending up at Media Molecule. Just a few days after publicly publishing his first LittleBigPlanet works, Beech was nearly crushed on the job. A factory extension's foundation had partially collapsed, so Beech jumped into a trench 8 feet deep and only the width of a man to fix it. "So I was digging it away and then suddenly one entire half of the trench instantly collapsed," he says. "I managed to jump as it happened, but it pinned me down and the concrete wall it was supporting slipped and hit me straight in the back. By all rights it would have chopped me in half, if it wasn't for a tiny alcove about the size of my waist that I somehow managed to slip into." Beech narrowly survived, and when he came home from the hospital noticed that hundreds of people were playing his LittleBigPlanet creations online. People immediately said that Beech should work for Media Molecule, so Beech eventually attempted to contact the developer. Not being a PC user, he missed Media Molecule's initial interest, but thanks to an outpouring of support from fans Media Molecule eventually got into contact with Beech and invited him to their studios. Beech showed up in a beat-up van, sweating profusely and lugging a PlayStation 3 that held his unpublished future creations within it. He evidently surprised Media Molecule with his use of their own tools so much that the employees sitting in on his demonstration gave him a standing ovation. Further, Media Molecule co-founder Mark Healey gave him a job on the spot. With absolutely no previous design experience, Beech's hire almost seems like a miracle, as did his survival of the construction incident. Nevertheless, Beech is an example of the fact that anyone can break into the videogame industry if they try.